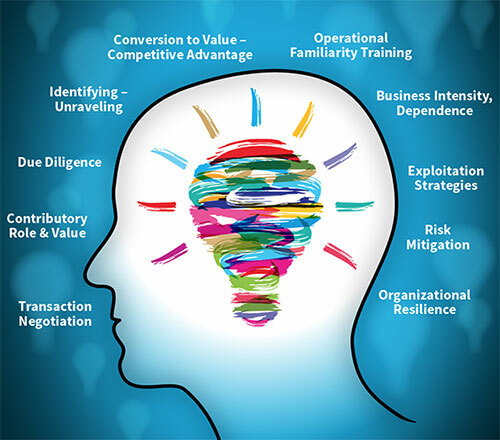 Intangible asset risk mitigation…i.e., at the right time, right place, and right way, can benefit company leadership and stakeholders anytime and in any circumstance in which valuable, revenue generating, and competitive advantage intangible assets are in play. develop ‘best practices’ for managing and mitigating risk to intangible assets in intangible asset intensive and dependent businesses, which are rapidly becoming the norm. alignment with (new – under consideration) regulatory (legal, accounting, taxation, and auditing) standards and practices. managerial (fiduciary) responsibilities related the stewardship and safeguarding of key business intangibles. use, ownership, competitive advantages, and contributory role and value of businesses key intangible assets. assess company’s exposure (vulnerability, probability, criticality) to the materialization of costly, momentum stifling, and potentially irreversible risks to intangibles. recognize that sustaining intangible assets contributory role and value are not mere operational electives that should not be dismissed, nor delayed. sustaining un-compromised control, use, and ownership of a businesses intangible assets which differentiate a company within its sector, i.e., its competitiveness, value, revenue generation, and sustainability, etc. company-business leadership teams are obliged to consider there will be various types, levels, and motives for risks to intangible assets to materialize. does not require leadership to reach beyond-outside their professional domains of expertise. how materialized risk can-may adversely affect asset value, competitiveness, exploitation, and further utilization, etc. A common denominator to intangible asset specific risk is the…persistent presence of (global) legacy free players, ultra-sophisticated data mining operations, and economic and competitive advantage adversaries, who, by their actions and capabilities, consistently impose risk. Reader comments, as always, are invited and respectfully welcome!